The holidays are inching closer and closer, which means many of us still have a lot of work to do! When it comes to holiday decorations, most people reach for string lights. Unfortunately, those string lights can force you to pay more on your electric bill. Thankfully, you can reach for solar Christmas lights to save the day and your holiday. For those of you who are new to using solar energy, you may have a handful of questions about how they work and how they benefit you. Do not worry because we have you covered. Here are the most frequently asked questions about solar Christmas lights. Solar powered Christmas lights actually work very simply. Solar string lights are just like normal string lights, except there is a solar panel at the end instead of a plug. This enables you to string the lights practically anywhere and place the solar panel in a sunny place. The panel absorbs the sun’s rays, converts it to energy, and stores it in its battery. The panels also have a sensor that detects when there is no sunlight available, which turns the lights on. Similarly, when the sensor detects sunlight again, it will turn the lights off. This means that you will not have to worry about turning your lights on and off each day and night because it will do the work for you. There are a handful of advantages and disadvantages of purchasing solar Christmas lights and using them in your holiday decorating. On the plus side, solar powered lights obviously do not need an outlet, so you do not have to run extension cords out to your yard. This not only lowers your electric bill during the holidays, but it also lowers your risk of fire. Solar Christmas lights run cooler and last longer than traditional string lights. Best of all, these lights are the most environmentally friendly of all string lights. Alternatively, solar powered lights are more expensive than electric lights. This may seem like a disadvantage at first. In reality, because they save you money in the long run, they are worth every penny! Generally, solar Christmas lights are 30 to 50 percent more expensive than other string lights. For example, a 100-foot strand of electric lights may be about 20 dollars, so the solar powered version would be about 30 dollars. One very real disadvantage to using solar powered lights is that they do not always perform well in inclement weather. Solar panels can still convert sunlight into energy on cloudy days, but odds are, they will not shine as bright or as long during bad weather. How Do the Batteries Work? The batteries on your solar Christmas lights work quite simply as well. One the solar panel converts the sun’s rays to energy, that energy goes to the battery. This allows your solar panel to charge the battery all day long so your lights can stay on all night long. Generally, if a battery is fully charged, your lights will stay on for eight hours. Now, the lifespan of your battery purely depends on the type and brand of solar lights you buy. If it has the common nickel cadmium battery, it should last about two years. Do Solar Powered Christmas Lights Need Direct Sunlight? As stated before, solar powered lights can still work in cloudy weather, but they will not work as well. An inadequate amount of sunlight during the day affects the brightness of your lights when it gets dark. On the other hand, more direct sunlight will make your lights shine brighter and longer through the night. For the best performance of your solar powered outdoor lights, let them have as much direct sunlight as possible. Do These Lights Work Better in Certain Geographical Areas? The short answer to this question is yes. Especially in the winter months, the weather in certain geographical areas can get nasty. This means that those in the northern states of the US and those in Canada are less likely to see a lot of success with solar Christmas lights. This also includes many places in Europe and northern Asia. On the other hand, the southern states in the US, Latin America, South America, southern Asia, Africa, and Australia see more sunlight during those months. This is all very general though. You are the best judge for your area. If you want to use solar powered Christmas lights, none of us are going to stop you from trying to help the environment. What Are the Different Types of Solar Christmas Lights? There are three main types of solar Christmas lights: string lights, figure shaped lights, and lamps. String lights are the most common type because they a lot of creativity when displaying them. You can find them in a single string, which is great for hanging on your roof and porch, or you can find net lights that are perfect for shrubs and trees. Figure shaped lights are basically repurposed pathway lights. They come on stakes that you stick in the ground, and they come in a variety of figures like Santa, snowflakes, and stars. Solar powered lamps offer the least amount of light of the different types, but they create a picturesque landscape. If One Light Goes Out, Will the Whole Strand Go Out? 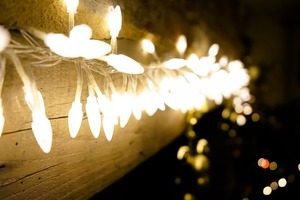 Many people have experienced their entire strand of string lights going out because of a single bulb. Thankfully, with solar Christmas lights, you do not have to worry about this problem. If a single bulb goes out, the entire strand will continue to shine. If it really bothers you, you can buy replacement bulbs. How Much Energy Do LED Christmas Lights Save? LED Christmas lights are superior compared to the incandescent variety because they directly convert energy to light without the use of a filament. To conserve even more energy, solar LED Christmas lights do even better. They operate using LED lights and use energy from the sun, which saves you a ton of energy. Traditional lights that use incandescent bulbs will use anywhere from 157 to 220 kilowatts per hour. When applied to your electric bill, these lights cost 16 to 23 dollars in a single hour! Using solar LED lights saves you a ton of money. On the other hand, LED lights only use about 20 kilowatts in a single hour. This means that your solar panel does not have to create as much energy to run the lights. Are There Tax Rebates and Other Incentives to Use Solar Lights? Many companies offer tax rebates on each strand of solar Christmas lights, as well as if you recycle your old lights. You will have to check out each strand of lights to determine if they have any promotions that apply to you. Where Can I Buy Solar String Lights? Because solar powered Christmas lights are becoming more popular, more places are starting to carry them. Some common places to look include Home Depot, Lowe’s, and Amazon. They have a variety of different lights to choose from as well, including both white and colored lights. Instead of remaining unaware of solar Christmas lights and how they work, read through each of these frequently asked questions to learn about them. There are several advantages that come from utilizing solar energy, and one of the most persuasive of them is the amount of money you will save over time. They are also great from the environment. Most people want a white Christmas, but you can make your holiday season a little greener.